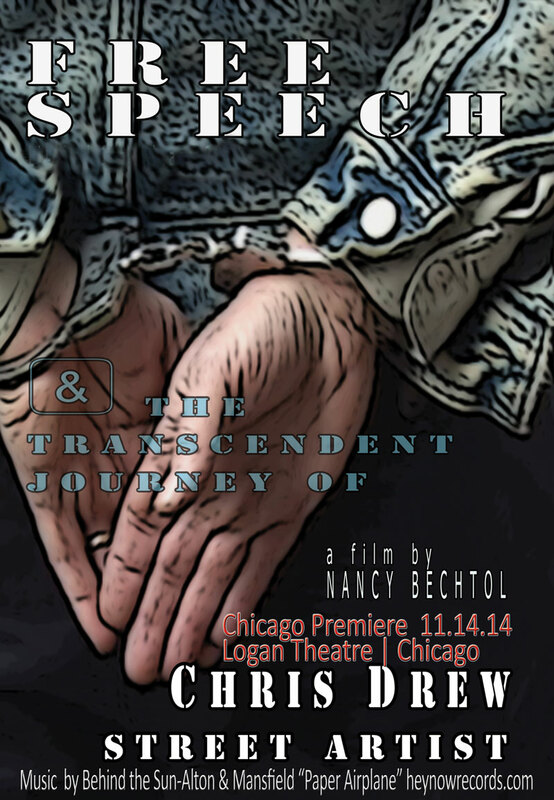 11.14.14 Marked Chicago and World Premiere of “Free Speech & the Transcendent Journey of Chris Drew, Street Artist” screened at the Logan Theatre. Local is best. 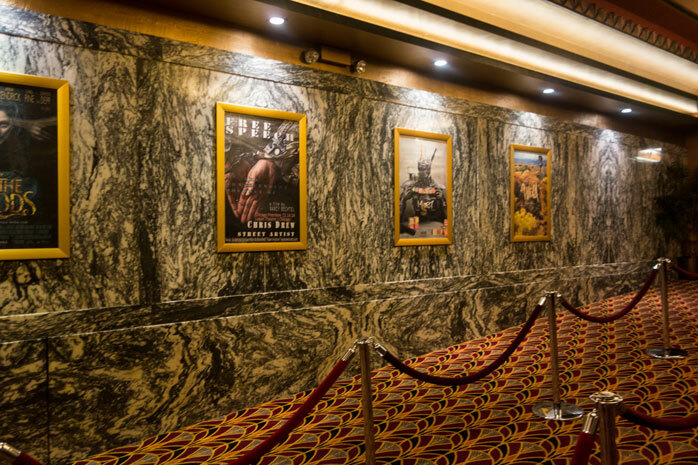 Special thanks To the media the Reader, Sun-Times, Logan TV and DNAinfo, Chicago Talks, Mark Thomas of the Alley Stores for the great collector buttons given at the premiere, and all those who blogged and grassroots rallied to support this journey and NOW indie feature film. You are the best! The thank you list is a good 3 pages long on the film credits, several of Chris Drew’s former students were there, Lew & Diana – with beautiful flyers and ongoing People’s Tribune tributes to Chris, as well as his widow Deborah, attorney Mark Weinberg, and (includes spiritual advisors and inspirations) John Lennon, Martin Luther King and Gandhi, his probono attorneys Weinberg and Kutnick, Music courtesy of Hey Now Records/’Paper Airplane’, by Behind the Sun-Alton & Mansfield, ( along with the ACLU, APA, CANTV, Occupy Critical Mass and our Public Servants(who legally can and will be recorded in public), and more. so many more…all listed in the film ) Special thanks to the crew who supported the film Ron Grenko and Hermann Wieland, and David Bechtol, Technical Supervisor and fixer of all things, without him this film would not have been made. Thanks for all who were there in person and in spirit! an excellent audience, we nearly filled the 102 seat theatre. very well attended! What an experience to see so many people and, most I did not know… that was amazing. The film is now for history, forever. 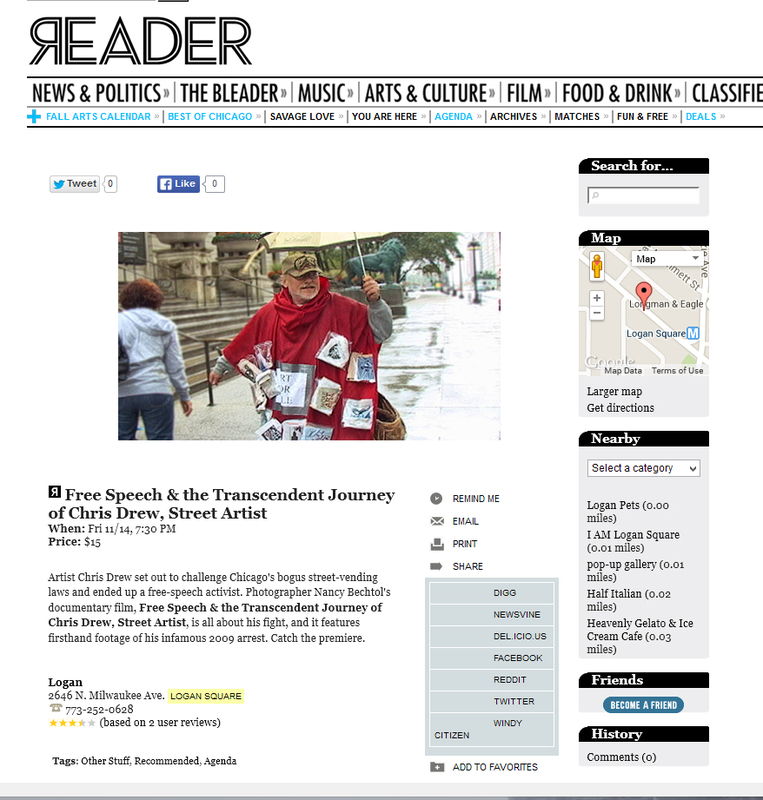 11.14.14 Street Artist Chris Drew Profiled: DNAinfo Holiday POSTS on the Film Premiere at Logan Theatre! http://lnkd.in/b7i-dqj 11.14.14 on spot! Darryl Holiday of DNAinfo posts a great and insightful article on the day of the Chicago Premiere! Many thanks for the grassroots support and interest. I am in awe and Gratitude being able to share this story of Free Speech and Peace through Justice! The Chris Drew Legacy lives on! Six months before he died, Chris Drew made sure hundreds of hours of recorded tape would tell his story. 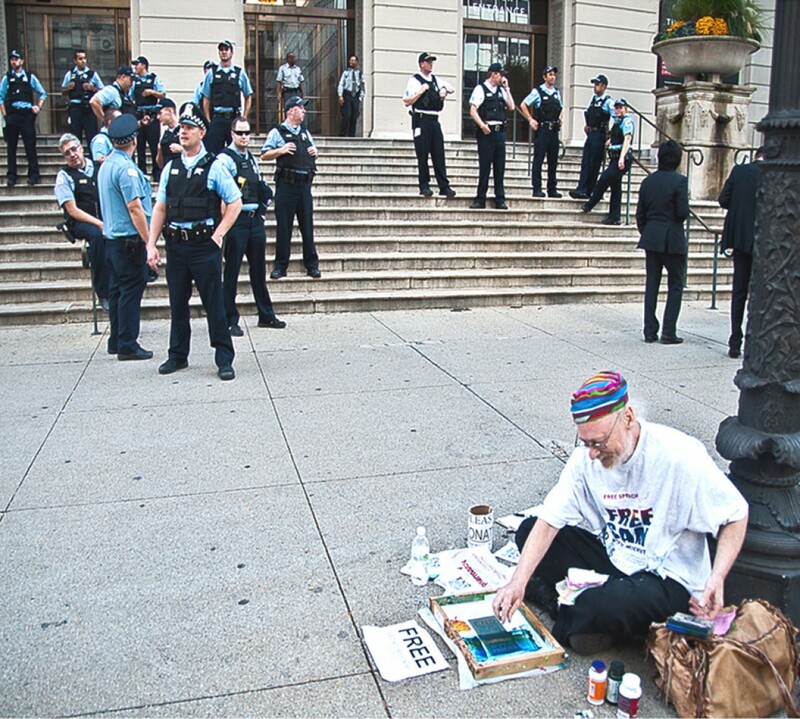 Chris Drew RIP (1950-2012) was heralded Patron Saint of Street Artists (first proclaimed by Kingdom, a street artist himself) and additionally, Defender of Free Speech! and now the truth, the rest of the story, for all time, for history, as given to me, slowly revealed in many ways, and sometimes through dreams by all the powers that be, I now give you the film. Chris Drew knew how to include other people…he was a very all inclusive person…Chris would call me the Idea Man, since I would come up with all sorts of ideas for artwork..(etc.) that is what I do in the movement (Occupy). He would ride his bike and have all these saddle bags and have all this screen print stuff, and we would go to different festivals..and he would be out there (UM-CAC Art of the TShirt) screenprinting and doing the patches (Art Patch Project)..and I would hold up patches and talk to people..
..always out there, always resilient, always in the face of the system..
© 2012 video – Ron Schupp: Chris Drew Legacy Interview #13. by Nancy Bechtol, APA Photojournalist. Organizer for Free SAM. Free Speech Artists Movement. 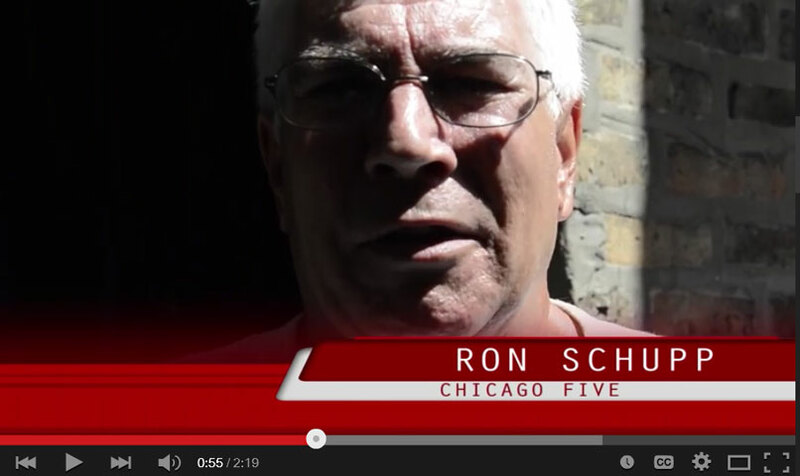 (note: “Chicago Five” case and the felony charges mentioned in this video –they were acquitted after 7 months through the judicial system) From the series of people sharing insights to the artist/activist and his life work.